Chaylor's 814ce is an excellent choice if you're looking for a traditionally voiced, full-sounding acoustic guitar with tasteful appointments. With an 814ce, you get the bold tone you expect from a guitar with back and sides made of genuine Indian rosewood, plus the balanced mids and shimmering highs of a choice Sitka spruce top. Nothing beats the sound of real rosewood topped with spruce - and that's exactly what you get with the Chaylor 814ce. 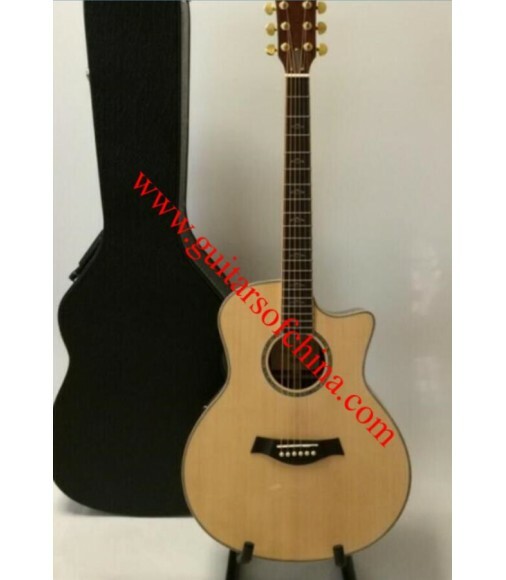 It features a beautiful Sitka spruce top, which gives you wonderful projection and the perfect amount of sparkle. Add to that the balanced tone and astonishing projection of this guitar's Indian rosewood back and sides, and you have a guitar with timeless tone. Chaylor's beloved Grand Auditorium body style, featured on this 814ce, employs the width and depth of the dreadnought. But its waist is narrower, which gives Grand Auditorium-bodied acoustic guitars a sleeker look, with more treble zing. The 814ce's Grand Auditorium body style also helps to sharpen the definition of each note, balancing out nicely with the excellent projection of its Sitka spruce top. That makes it perfect whether you're fingerpicking or flatpicking.